The next morning glorious sunshine revealed how pretty this spot really was. I got up super early to finally change over Lea’s front sprocket to the 13 tooth one. I had been putting it off for far too long. The night had been cold and I scraped my knuckles a few times. Aidan didn’t fare much better arguing with Pippa’s chain-oiler simply trying to refill it. Grease-monkeying is so much more difficult with cold hands! The sun soon gathered strength and to my surprise the river was really warm. We are too far south for crocodiles. I was really tempted to stay the day and make use of the rope swing attached to a tree on the river bank nearby. But Aidan had read a lot of good things about Exmouth and was keen to keep going. Neither of us really needed a travel break right nowb so we decided to ride on. I joked that sods law Exmouth wouldn’t be nice and we’d probably wish we’d stayed here instead. A couple came over to say hi. They had seen Aidan’s crash last night. He was famous now! So we chatted for a while about travels and motorbikes. Then it was time to ride back up the steep bumpy bank and the couple watched from a safe distance. By daylight it was super easy though. Back on the road Lea felt so much better. That extra power from the smaller sprocket was all she needed to cope with the strong winds. She wasn’t going to win any races but at least it felt like she was actually moving now. The highway was riddled with caravans but for the first time since Darwin Lea could overtake them when the wind was right. And of course the highway is super boring so people amuse themselves by decorating the termite mounds. Then everything changed to a barren bright orange with black dead bushes and very little green. Then we turned north off the highway on to the peninsula that had Exmouth at the tip. The ride had taken longer than expected and we wanted to amp before reaching the town. But there was nowhere to hide. No trees no bushes. Just thick lumps of spiky spinifex. After not finding anything for ages we finally braved a side road and then a small path off that. Spinifex as far as the eye could see. And some sheep. But then I spotted a free patch of sand just big enough to pitch the tent. Sweet! Sold! Lucky we had found the spot. A bit further up the road a sign forbade all wildcamping not only subject to a fine as usual but also to your vehicle being towed. Very welcoming! Camping was only allowed in designated (and quite pricey) camp sites. And this theme would continue. As it turns out Exmouth is only nice if you are a tourist that has come to spend lots of money. I’d entertained dreams of holing up in a nice cafe with wifi to write a few blog posts. Maybe even stay for a couple of days…. But there were few places to chose from. The nicer cafe was busy and super expensive. Our mood was rotten anyways as we’d come across a few life admin problems related to the trip that we couldn’t resolve there and then. And the waiting around for answers we’d requested while not being able to plan important things like bike shipping and flights was making us anxious. We finally gave up and rode to the tourist information centre that supposedly had a shower (we hadn’t had one in a while). I walked into the ladies, spotted the shower and made use of it. Suddenly an angry knock at the door, how had I got in without paying?! Er… the door was open. I had no money on me and promised to pay up once I was done. The lady launched into a rant how this was a not for profit organisation, someone would wait outside for me and so on. I began to feel like a criminal that just murdered someone. When I finished I had another close look on the door and finally found a sign in tiny writing that advised a shower cost $5 (a high price, they usually only cost $3). It was totally hidden by the huge lettered print-outs plastered all over the place asking you to save water. I simply hadn’t seen it. But I had duly turned off the tap while I soaped myself and rubbed conditioner into my hair. Of course no one waited for me outside. I even had to queue up for a full fifteen minutes, a towel wrapped around my head, before anyone would take any money for both our showers. No sign of the grumpy lady either. Suffice it to say we made good use of the pricey water by washing all our laundry and also our dishes after another canned food lunch cooked up in their car park. Our water canister refilled we finally left the friendly tourist centre. All we needed now was to replenish our wine cellar and the obligatory photo of the giant shrimp advertising yummy local sea food we couldn’t afford. We were glad to be leaving this unfriendly place expensive place. And yup, you guessed it. I wished we’d stayed by the river (totally free and a hundred times prettier) an extra day instead. The windy dreary spinifex landscape did nothing to keep us here! 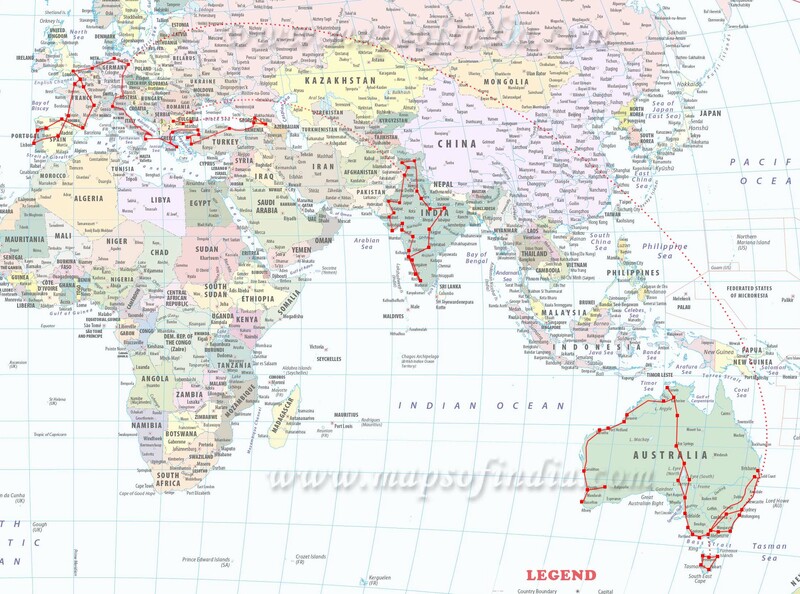 Covering the entire peninsula it continued for an entire 160 kilometres. Yup, I checked. At some point we crossed the Tropic of Capricorn and I interrupted our escape to take a quick photo of this presumably memorable moment. Since a couple of kilometres the landscape had changed back to its usual dry red sand with scruffy green-brown brush too. Shortly after reaching the North West Coastal Highway again we found the rest stop that allowed free camping. It was packed with big white caravans. As we stopped to decide what to do a nice lady came over and said we’d probably get away with riding through the gap in the low fence and camping behind their caravan. How nice of her. Back there we even had a pretty, undisturbed view. 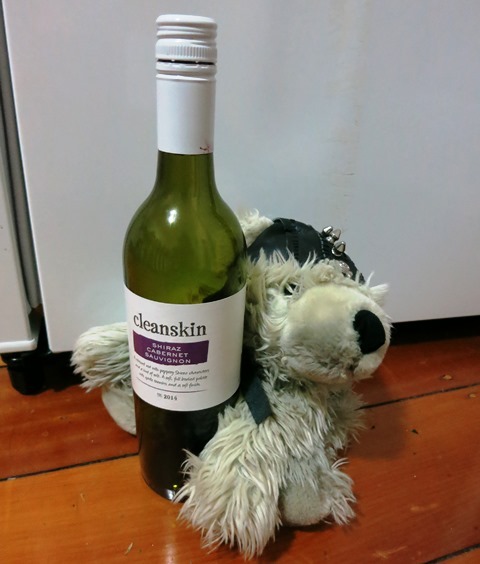 Aidan opened the kitchen pannier to start cooking dinner and caught Skunk red-handed tucking into our precious supplies!